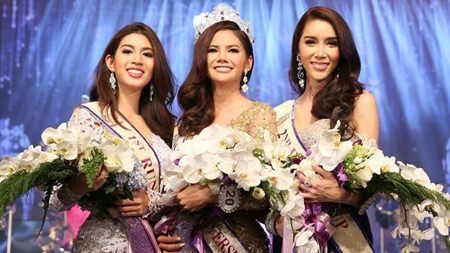 A Phranakhon Si Ayutthaya Rajabhat University student bested 30 other finalists to win the Miss Tiffany Universe transgender pageant in Pattaya. Public-health student Sopida “Baimon” Siriwattananukul, 22, was awarded 2 million baht in prizes, including 120,000 baht in cash and a Honda Jazz. She will next represent Thailand in the Miss International Queen pageant at the end of the year. The first runner-up was 21-year-old Kanchaya Kanchanakul and the second runner-up was 23-year-old Pimnara Athiphatdejakorn. Tiffany Show Chairwoman Alisa Phansak said the goals of the contest were to promote and support Pattaya’s tourism industry and make it world-famous. 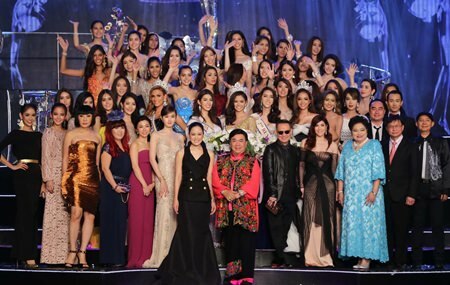 Sopida “Baimon” Siriwattananukul (center) was crowned this year’s Miss Tiffany Universe. Kanchaya Kanchanakul (left) finished 1st runner-up, with Pimnara Athiphatdejakorn (right) 2nd runner-up.